I was planning a post about things that get on my nerves about football – including but not limited to booing other teams (which coincides with Mal’s memo) and your own team, the use of possessive pronouns in describing the football team, and (I’m, sure I’m in the vast minorty here) the moniker, Bama. Something that has come up time and time again and I feel the need to address it, once and for all. It has become a much more popular thing that it should – I’m certain that a lot of it has to do with antagonizing Alabama fans – but I’m really tired of the insinuation that Paul Bryant did not wear houndstooth; that somewhere in the mid-eighties somebody thought he wore houndstooth hats and without really checking the facts a trend that borders on obsession began. To begin with I believe that the pattern has been exploited a little too much in its use for Alabama themed merchandise. I poked fun of this for my piece on EDSBS earlier in the summer, but I also truly believe that while it has become associated with Alabama, it will never replace Crimson and it is truly unique to Alabama. This is in contrast to, I don’t know, let’s see, yeah the color orange. Because nobody is using that. Also, if I shared the most common mascot name in college football, even if my “battle cry” is something different, that I’m going to go and poke ant hills just to stir them up while I’m standing next to them. I’d stick to my recent streak and leave it at that. Then again, that’s just me, and I’m a gambler. The general theory is that Bryant wore plaid hats and that they were not houndstooth and that we are all a bunch of rubes (or putzes, I believe) to follow like sheep and purchase or wear anything with the pattern on it. You really must not know anything about fashion, or clothing in general, whatsoever to put yourself out there and make that assumption. Or really be to lazy to check before you put something out there so emphatically that you’re willing to belittle others while actually shining the light back on yourself. Of course when your wardrobe consists of a slew of Tiger Rags tee-shirts and Wal-Mart camoflage and you beleive that last year’s clearance bin Tommy Hilfiger polos are the apex of men’s fashions then what do you expect (I’m just kidding guys, my vet’s scrubs look really nice whether he’s in his office or after hours). My parents and several other successful business people that I have sought to emulate have always taught me that looking well and presenting yourself are important parts of succeeding. It is only natural that one would learn a little bit about fashion or more so what’s both appropriate and appealing to others. And while I can’t claim the expertise of “Queer Eye for the Straight Guy” I can safely offer a little lesson on houndstooth. Houndstooth is a type of plaid. It is characterized by a checked pattern alternating between dark and light colors. Don’t believe me, then go here (note the Bryant reference as well). The size of the pattern is not important, thus there is a broad range in appearance. The pattern is employed on anything and everything but typically the tighter the weave the more suited it is to more formal occasions. Suits, pants, shirts, and yes even fedoras have been constructed of it for a long time and are sold in places where no one has ever heard of Alabama. At a distance the smaller pattern can appear almost gray. The trend lately, especially in merchandising has been to accentuate the pattern and make it more recognizable. The pattern is clearly visible in the photo above. Plaid? yes, but also houndstooth. Above with former LSU coach Jerry Stovall who is wearing hounstooth slacks. I think that should just about do it. Claiming that he didn’t wear houndstooth but plaid is the same as saying Alabama fans don’t wear crimson they wear red. They would both be incorrect statements. Finally, the assumption that Paul Bryant didn’t wear houndstooth can be attributed to ignorance. I’m not using that word to insult anyone; you’re ignorant if you don’t know the facts. The good news is ignorance can be cured and in fact, just was. Unfortunately there is no known cure for stupid. [Eds. Note: Will Heath brought a great comment and I wanted to include it in the post. This is the great thing about the blog. Will added a great bit of knowledge that I did not know. i agree with everything…except i’m a heavy user of ‘bama. its more laziness than anything else. i also say things like va tech, la tech, d-backs, etc. i will however punch someone in the sternum for using things like “we” and “us” in regards to their favorite team though. While I understand what you’re saying about houndstooth being a type of plaid, the fact is Bryant didn’t start wearing the houndstooth until some time in the 1970s — and then, he wore it because it was a gift (either from his granddaughter or someone else’s, I don’t recall). Note that in all those photos of him wearing houndstooth, he’s quite old — for most of his career he wore a regular, non-houndstooth, men’s hat. It became his signature after he died because it was distinctive, but it wasn’t his modus operandi until very late in his career. 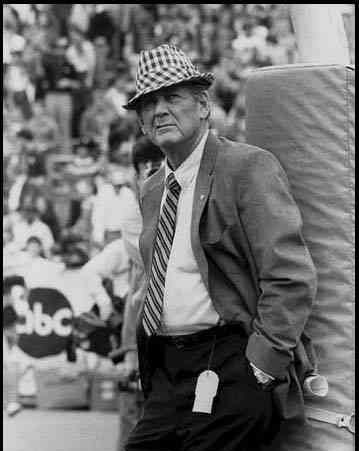 You proved me wrong and found a picture of Bear Bryant wearing Houndstooth. I wasn’t able to find that picture but it does appear to be the correct pattern. Of course my point was that you also posted three pictures of him wearing black and white plaid hats that are not actually houndstooth because they do not have a “broken check” or “jagged edge” as to resemble a hound’s tooth (all of the squares in the hat have flat sides). Yes all houndstooth is plaid, but obviously all black and white plaid is not houndstooth. As you can tell the “giant houndstooth hat concession roof” in no way resembles that hat in the first three pictures or most pictures of Bear. It’s not really a big deal, I just think it’s kind of silly. Very similar to people thinking the line “play it again Sam” is in Casablanca. Congratulations on the Clemson win. Stovall’s slacks are Glen Plaid. While all houndstooth is plaid, not all plaid is houndstooth. Wiley, According to the wiki entry, Glen Plaid is a variant of houndstooth and agreed that all plaid is not houndstooth. I was not trying to state that it was. I might have gotten over my head here and my try to talk to some actual experts on this. At any rate, I appreciate all the comments. I have a hat that was sold sometime in the 70’s that is plaid – check as in some of the pictures posted here, it was sold as the “Original Paul Bear Bryant Hat – printed on a round black label inside the hat”, his signature was also on the hat but mine has worn off. I picked it up at a yard sale. I wish they would remake the one I have, it doesn’t look as “cheesy” as the new houndstooth hats.